Coat your stove top in non stick cooking spray, grill thinly diced chicken breast on your stove top over medium heat stirring until the chicken is turning golden (roughly 10-15 minutes). Add in 1/2 of a diced onion and grill for about five minutes more. Add in broccoli slaw and stir. Scramble 2 eggs and 1 egg white (save yolk in a bowl for later. Mix 1 cup mozzarella with the eggs and pour over your chicken stir fry Mix until cheese is melted and eggs have cooked (5 minutes or so). Grab your egg roll wrappers and egg yolk. Scramble the egg yolk with a little water (about 1/4 cup of water). Place 2 tablespoons of your stir fry mixture on the egg roll wrapper and wrap egg rolls (the diagram on the egg roll wrapper container is amazing). Once wrapped coat in the egg yolk mixture and place in an oven safe dish. This makes about 10 egg rolls. 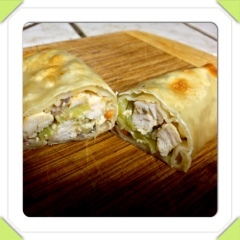 Once all the egg rolls are wrapped broil over low heat in your oven turning them over ever 5 minutes or so until they're golden on both sides and enjoy!